Federal researchers have taken a step forward in the battle against the invasive Asian longhorned beetle (ALB). A recently released U.S. Forest Service study revealed the tree-killing ALB to be more than four times as likely to successfully develop into an adult when feeding on red maple versus other species of maple in Massachusetts. A typical round exit hole of the adult Asian Longhorned Beetle (image from extension.umass.edu). The researchers looked at two forested areas comprised of multiple hardwood species within the Worcester, Mass. ALB quarantine zone. While ALB egg sites were found in red, Norway, and sugar maple in the stands studied, fully grown beetles chewed their way out of 15% of the Norway and just 12% of the sugar maple trees. Nearly 60% of the red maple trees examined produced adult beetles. The results from this study add further evidence to a 2011 Forest Service and Harvard University study that suggested ALB more often attacked red maple. That work assisted in prioritizing some survey and trapping resources in Massachusetts. Fortunately, New Jersey and Illinois have eradicated ALB infestations. Eradication activities continue in Massachusetts, New York and Ohio. All known host tree species are still at risk of being attacked by the beetle and having adults emerge. Potential hosts include: ash, birch, elm, goldenrain tree, hackberry, horse chestnut, katsura, London plane tree, maple, mimosa, mountain ash, poplar and willow. A maple tree with visible Asian Longhorned Beetle Damage (image from bugwood.org). 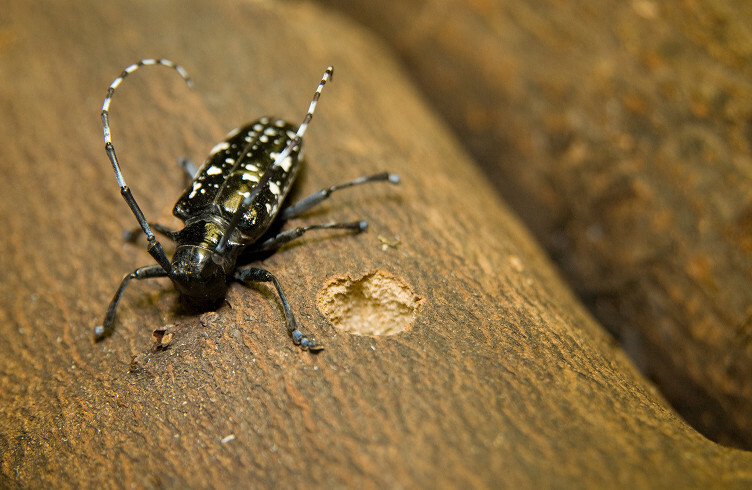 For more information regarding the complete study, “Colonization of Three Maple Species by Asian Longhorned Beetle, Anoplophora glabripennis, in Two Mixed-Hardwood Forest Stands,” visit: http://www.mdpi.com/2075-4450/5/1/105.